1972 Chevrolet El Camino. This car has just had a complete frame off restoration from top to bottom inside and out. Powered by a fresh super strong 454 Motor and turbo transmission. This is a new car that is ultra show car ready it would cost well above the asking price to start to build one to this condition. The Flawless Black Paint And White Stripe Look Amazing. Has The Functional Cowl Hood. The A/C System has been upgraded to a Vintage Heat And Air Unit. If You Are Looking For A cheep El Camino This is not It. However If You Are Looking For That Show Winning Ultra Nice Car Here She Is. 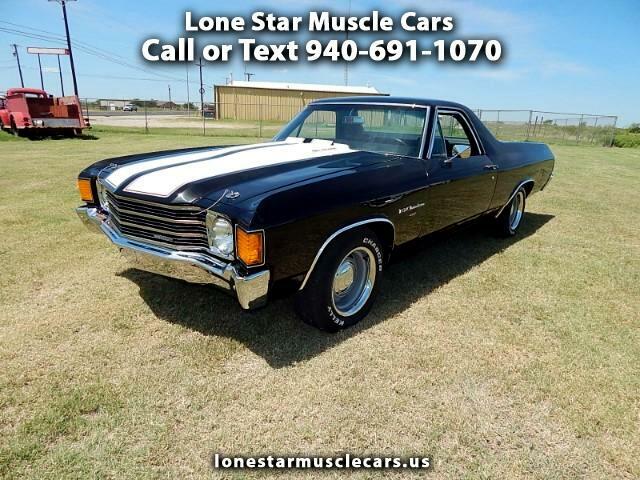 Message: Thought you might be interested in this 1972 Chevrolet El Camino. All Payments Shown Are With W.A.C. @ 4.95% With 10% Down At 120 Months Outside Finance Source. Tax, Title, Registration Extra All Texas Residents T.T.L. Due At Time Of Sale. We Offer No In House Financing. See Dealer For Detail. .